Democratic Representative Lacy Clay keeps hanging up this awful painting that depicts law enforcement officers as pigs. The painting was done by an African American 18-year-old high school student who won some art contest, and the painting is terribly offensive. 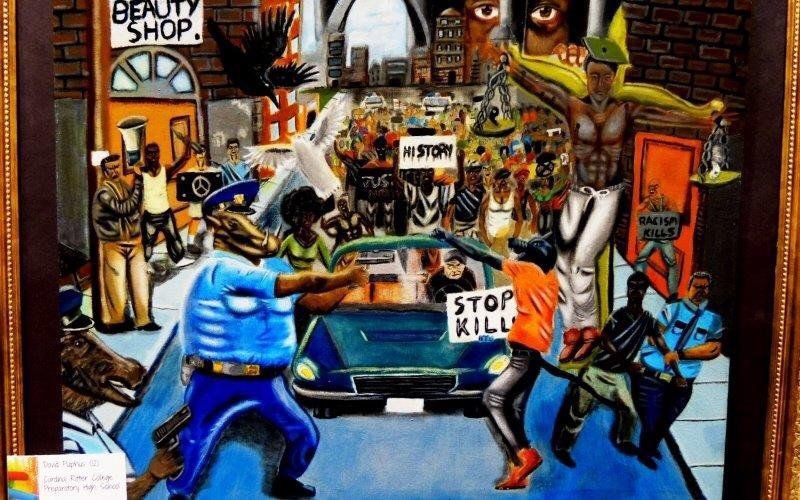 The painting appears to be set in Ferguson Missouri, during the riots when criminal Michael Brown was shot. This wretched piece of “art” has signs that say “Stop Killing” and “Racism Kills”. There is also a black man who is being crucified in the foreground of the painting. See anything wrong with this? If you’re a liberal, you probably think the painting is beautiful. However if you’re a conservative, have any ties to law enforcement, or you just have respect for the law and our officers, than chances are, you hate this “work of art” as well. To think that a member of the Capitol actually has the nerve to not only hang this painting, but continuing to re-hang the painting is just plain distasteful. Our law enforcement officers are here to protect and to serve the people of their community, they are heros. Mr. Clay’s blatant antipathy over the subject at hand speaks volumes of his overall character. It’s a shame that our law enforcement heroes have to see and hear about things like this. They are not the enemy, in any of this. The hanging of this unsightly painting is why the country seems to be at war with the police. 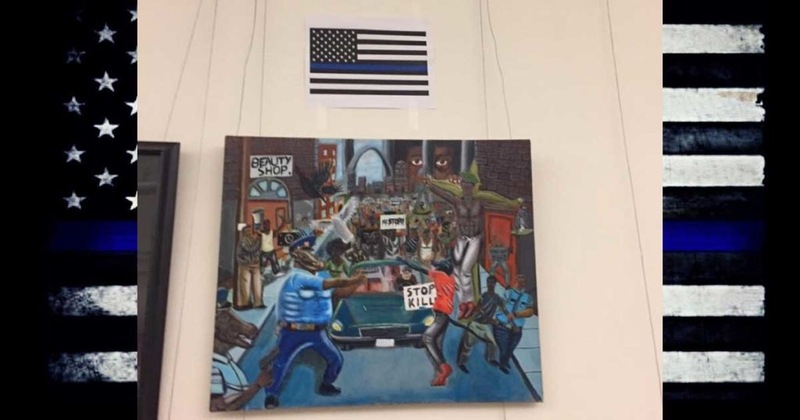 By no means does the act of hanging a painting like this help anyone with the war on our law enforcement. Shame on you Mr. Clay. Shame. *On behalf of our page, we would like to personally thank all of the law enforcement officers around the country who risk their lives everyday to protect and serve their people.